You hold a Private Pilot license but find yourself grounded on days that bring low ceilings and visibility. Or perhaps the concern for changing weather patterns deters you from making long-distance or long-term trips. If inclement weather is getting in your way of flying then the next step is to begin training to achieve the Instrument Rating. Achieving the Instrument Rating will take your skills to a completely different level that requires flying with extreme precision while relying exclusively on your onboard equipment for control and navigation. Not surprisingly, some choose to obtain the Instrument Rating simply to become better, safer, and more well- rounded VFR pilots. The flight training may be conducted in our Piper Warrior II, Piper Warrior III, or Piper Archer III. What Can You Do With An Instrument Rating? 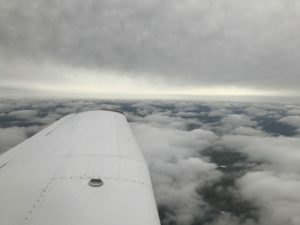 An Instrument Rating allows an already licensed Private Pilot to operate an aircraft (own or rent) for pleasure or utility during periods when the weather is below VFR minimums. 2.) 40 hours of flight training in actual or simulated instrument conditions.